Definition at line 23 of file SystemZInstPrinter.h. Definition at line 25 of file SystemZInstPrinter.h. References getRegisterName(), llvm::MCInstPrinter::MAI, MI, llvm::RISCVFenceField::O, printAddress(), printInst(), printInstruction(), printOperand(), and printRegName(). Referenced by printAddress(), printMCExpr(), printOperand(), printRegName(), printSImmOperand(), and SystemZInstPrinter(). Definition at line 26 of file SystemZInstPrinter.cpp. 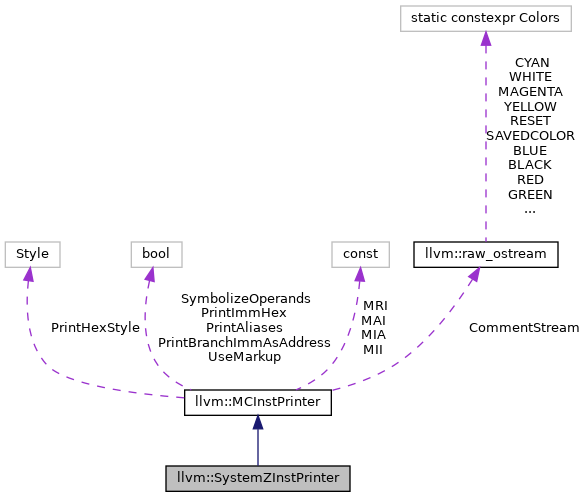 Referenced by llvm::SystemZAsmPrinter::PrintAsmMemoryOperand(), printSImmOperand(), and SystemZInstPrinter(). Definition at line 54 of file SystemZInstPrinter.cpp. Referenced by printInst(), and SystemZInstPrinter(). Definition at line 42 of file SystemZInstPrinter.cpp. References llvm::MCOperand::getExpr(), llvm::MCOperand::getImm(), llvm::MCOperand::getReg(), getRegisterName(), llvm::MCOperand::isExpr(), llvm::MCOperand::isImm(), llvm::MCOperand::isReg(), llvm_unreachable, and llvm::MCExpr::print(). Referenced by llvm::SystemZAsmPrinter::PrintAsmOperand(), printSImmOperand(), and SystemZInstPrinter(). Definition at line 61 of file SystemZInstPrinter.cpp.